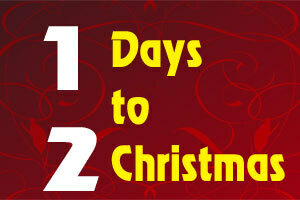 Today we start a "The Twelve Days of Christmas." Each study ill be, by necessity, just brief introductions to the themes contained within them. The birth of Jesus Christ is the most celebrated around the world. The celebrations transcend cultures, peoples, and languages. The celebrations are also just as diverse. Of course most people stop with Jesus being a baby and continue no further with Him. Jesus Christ is the most unique person in history. Jesus Christ is also the most divisive person to be found at any time and anywhere. Almost everyone has an opinion about Him, even if that opinion is based on ignorance, silence or misinformation. As Christians we believe that Jesus' birth was the culmination of thousands of years of God telling the world that He was coming. From the time of the Fall when people showed active rebellion and disobedience towards God in Genesis 3, God was planning the time when He would step into history in the man, Jesus Christ. Throughout the Old Testament, we see that the birth, life and mission of Jesus Christ is the aim and focus of attention. We see it in the stories of people like Abraham and Moses. We see it in the nation of Israel, which was to be God's light to all the nations. We see it in the Israelite sacrificial system and law. We see it during the time of the Judges and the Kings. We especially see it through the prophets. The whole Old Testament is joined together, because it all speaks about this baby, Jesus Christ. This baby, who was both 100% human and 100% divine, grew in wisdom and stature. This baby was born in order that He would die on a cross some 33 years later. He did not die for his own sins, but for the sins of the entire world - all past, present and future sins. This baby was born to die so that the entire world may have life and life everlasting, if each individual chooses to accept it. Let us discover together what two people had to say about him. These twelve studies will based in the book of Isaiah and the book of Zechariah. Firstly, let me introduce these two books to you. The author is self-identified as Isaiah, and his name means "The Lord Saves". Isaiah wrote around the same time as Amos, Hosea and Micah. He started about 740BC and it was during this time, that Israel was declining and the Assyrian Empire rapidly expanding. In his writings, Isaiah reveals a great deal regarding God's judgment on sin and salvation from sin. During these studies, as we have seen, will primarily focus on the later chapters. Isaiah 9:6-7 - For to us a child is born. To us a son is given; and the government will be on his shoulders. His name will be called Wonderful, Counselor, Mighty God, Everlasting Father, Prince of Peace. 9:7 Of the increase of his government and of peace there shall be no end, on the throne of David, and on his kingdom, to establish it, and to uphold it with justice and with righteousness from that time on, even forever. The zeal of Yahweh of Armies will perform this. Isaiah 53:5-6 - But he was pierced for our transgressions. He was crushed for our iniquities. The punishment that brought our peace was on him; and by his wounds we are healed. All we like sheep have gone astray. Everyone has turned to his own way; and Yahweh has laid on him the iniquity of us all. The author, again, is self-identified, in this case Zechariah. Zechariah, a young man, was not only a prophet, but also a member of a priestly family. He was born in Babylon and had returned to Jerusalem under Zerubbabel's leadership. Zechariah was active around the same time as the prophet Haggai. This period of time, 520BC to 480BC, occurred in the postexilic period after Israel was restored from Babylonian captivity. Zechariah 8:3 - Thus says Yahweh: "I have returned to Zion, and will dwell in the midst of Jerusalem. Jerusalem shall be called ‘The City of Truth;' and the mountain of Yahweh of Armies, ‘The Holy Mountain.'" Zechariah 9:9 - Rejoice greatly, daughter of Zion! Shout, daughter of Jerusalem! Behold, your King comes to you! He is righteous, and having salvation; lowly, and riding on a donkey, even on a colt, the foal of a donkey. So there we have a very brief introduction to the book of Isaiah and the book of Zechariah. If you find these resources helpful to you, please do prayerfully consider making a donation. please do click the Paypal Donate image below. Thank you. Click the image above and the video will play! Time for your own prayers! Let us now pray for these people who are ill.
Milly, Dorothy, Kath, Joy, Christina, Margaret, and Ron! Give comfort to them and all those who are ill, give wisdom to medical staff treating them and from your wellsprings of mercy grant a healing touch! Father, we especially lift to you Patti who was recently diagnosed with lupus and recovering from surgery. We ask o Lord that you would provide a healing touch and patience for her to endure. Grant also, most merciful Father, peace to her mother and family - a peace that only You can provide. Amen! We also lift to you Florence who was baptised last Sunday! We ask O merciful Father, that You would protect her! Give her, O great and marvellous God, a sense of peace and grant her boldness! We ask these things O gracious Father in the name of your majestic son, Jesus and in the power of the Spirit who lives within us. Amen! G'day! 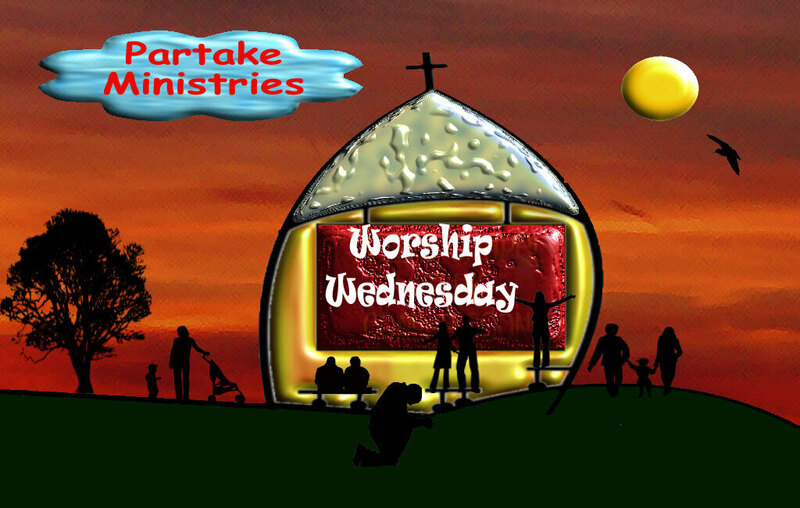 Welcome to Partakers Wednesday Worship on 9th of November, 2011! Almost everybody has an opinion of the man Jesus Christ! Countless millions worship him today and down through history! People sometimes ask me "Who is my Jesus?" So, let me answer that briefly - "Who is my Jesus?" My Jesus Christ, the man who healed the sick, fought for justice, did many great deeds, filled with compassion, driven on by joy and in constant conversation with God the Father. My Jesus Christ, is the man who claimed to be God and was God! Jesus who emptied Himself, made Himself nothing, so as to take on human form. Jesus Christ, fully human and yet fully God. My Jesus Christ, is the most amazing man who ever lived, born of a woman, in a humble stable. Jesus Christ, the man born to die that he may come back alive and give all people a chance to live forever. My Jesus Christ, is the man who died on a grubby Roman cross, pierced, battered, bruised and scarred. Jesus Christ, the God-man who died physically. Jesus Christ, buried within and sealed into a cold empty tomb. My Jesus Christ, is the man who conquered death, came back alive as witnessed by uncountable others. Jesus Christ who defeated the sting of sin, so that humanity may choose to live forever! My Jesus Christ, whose very death and resurrection we celebrate at Easter, who ascended to the right hand of God the Father. This Jesus Christ, who with the Father, sent the Holy Spirit to transform into His own image, all who choose to follow Him. My Jesus Christ, who covers His followers in His own robe of righteousness so that they would be acceptable to God the Father. Jesus Christ, coming again soon in glory to judge humanity and claim those who follow Him. Jesus Christ who calls to you and I "Come and follow!" If that's my Jesus Christ, why am I a Christian and identify myself as such? The Apostle John, writing in 1 John 5:9-12 - "We accept man's testimony, but God's testimony is greater because it is the testimony of God, which he has given about his Son. Anyone who believes in the Son of God has this testimony in his heart. Anyone who does not believe God has made him out to be a liar, because he has not believed the testimony God has given about his Son. And this is the testimony: God has given us eternal life, and this life is in his Son. He who has the Son has life; he who does not have the Son of God does not have life." I am a Christian Disciple not because of anything I have done, but rather because He first chased me, and because He first loved me. Jesus himself said "I came to seek and to save the lost" (Luke 19v10). God was chasing me and following my every path with the urgency of a lover after the beloved, just as described in the Song of Songs 2v2-14. If you are a Christian today, it is not because of anything you have done. It is because of the events at Christmas and Easter that you are a Christian, when God entered this world as a human baby and took all the necessary steps so that all people could have the choice to be His people or not. In my more smug moments I used to congratulate myself for being a Christian. How proud I was that I, was a Christian and that God was a jolly lucky God that I had decided to follow Him. It was during one of my less self-deluded moments, that I examined myself and I found God pricking my conscience and correcting me, and I read the New Testament "For the Son of Man came, not to be served but to serve and give His life as a ransom for many" (Mark10v45). This Jesus, my Jesus, also calls you! Immediately Jesus made the disciples get into the boat and go on ahead of him to the other side, while he dismissed the crowd. After he had dismissed them, he went up on a mountainside by himself to pray. When evening came, he was there alone, but the boat was already a considerable distance from land, buffeted by the waves because the wind was against it. During the fourth watch of the night Jesus went out to them, walking on the lake. When the disciples saw him walking on the lake, they were terrified. "It's a ghost," they said, and cried out in fear. But Jesus immediately said to them: "Take courage! It is I. Don't be afraid." "Lord, if it's you," Peter replied, "tell me to come to you on the water." If you would not call yourself a Christian today, and this Jesus appeals to you, this Jesus who speaks with authority, and you want to become a Christian there are three simple steps to follow. Firstly, admit that you have done wrong against God and His ways. Secondly, believe and trust in Jesus. Call on Him, receive, trust, obey and worship Him, recognizing Him for who He is and what He has done. Lastly, confess Jesus as your Lord and Saviour. Once sin has been confessed, and Jesus is believed in and trusted as Saviour, then you are a Christian. Now you are ready as Peter writes in the Bible, "to grow in grace and knowledge of our Lord Jesus Christ" (2 Peter 3:18). Welcome to the family of God. 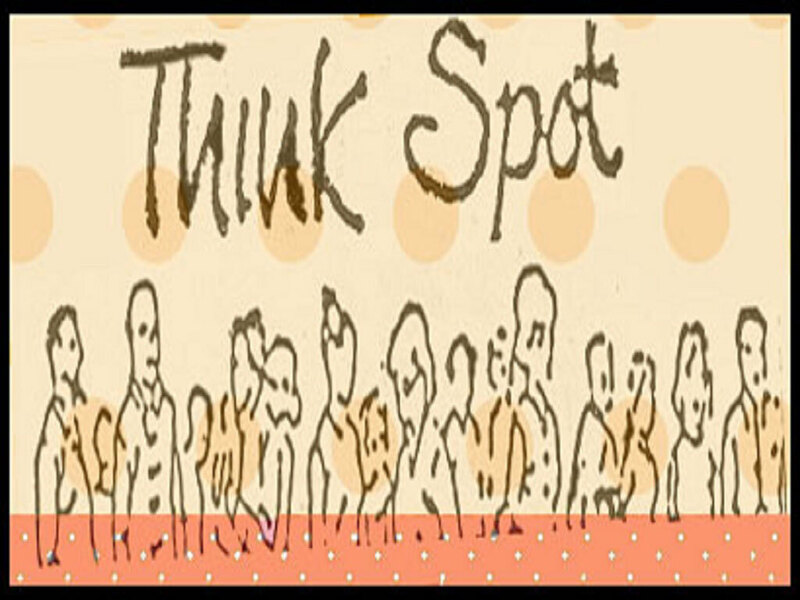 God has chosen you; Jesus has paid for you and has put His mark within you through His Spirit (Ephesians 1:1-13). Matthew 7v21-29 Not everyone who says to me, ‘Lord, Lord,' will enter into the Kingdom of Heaven; but he who does the will of my Father who is in heaven. Many will tell me in that day, ‘Lord, Lord, didn't we prophesy in your name, in your name cast out demons, and in your name do many mighty works?' Then I will tell them, ‘I never knew you. Depart from me, you who work iniquity.' Everyone therefore who hears these words of mine, and does them, I will liken him to a wise man, who built his house on a rock. The rain came down, the floods came, and the winds blew, and beat on that house; and it didn't fall, for it was founded on the rock. Everyone who hears these words of mine, and doesn't do them will be like a foolish man, who built his house on the sand. The rain came down, the floods came, and the winds blew, and beat on that house; and it fell-and great was its fall." It happened, when Jesus had finished saying these things, that the multitudes were astonished at his teaching, for he taught them with authority, and not like the scribes. Up until now, Jesus has been issuing instructions. It is here, therefore, that He issues the 2 choices we face when having heard His words~ He concludes his sermon with a heart-wrenching application. Last week we heard about false prophets, and this week false professors, from unsound teachers to unsound hearers. Jesus confronts us with himself, sets before us the choice between obeying his words and disobeying them. He then proceeds to call us to firm commitment of mind, will & life to himself and his teaching. In v21-23, he warns us of mere spoken profession, and in vs. 24-27 of a mere intellectual knowledge without any practical knowledge. Each one of these, is a substitute for the obedience that Jesus asks for. These final two passages, are very similar. Both contrast the right & wrong responses to Jesus & his teaching. Both show a definite decision must be made; and that nothing replaces an active, practical obedience. The only difference between the passages, is that the first is to people who only say they are Christians and the second is to people who only have an intellectual acceptance of Jesus and his teachings. The people that Jesus refers to here, are those that say they belong to Him, but in practice do nothing to change their lives in accordance to his teachings. V21 States that not all who say to me "Lord, Lord" will enter the kingdom of heaven. Our final destiny will be settled, Jesus says, neither by what we say to him either today nor on the last day, but whether we practice what he teaches and obey him. It is true, however, that we are to speak about Jesus and his teachings. In Romans 10,9-10, Paul wrote that we have to confess with our lips and believe in our hearts. A true profession of Jesus is impossible without the Holy Spirit (1 Corinthians 12:3). Is there anything wrong with calling Jesus Lord? In itself, no. However, if there is no moral & practical application, then it is merely lip service and is worth nothing. To that group of people, who do not talk with truth, and profess Jesus without reality, will not be saved. People who only live a verbal confession of Christ can be full of courtesy, enthusiasm, and orthodoxy in private worship and public ministry and yet live without any of the moral teaching of Christ. Look at the list given prophecy, casting out demons and doing mighty works in His name. Yet, if they do not do the will of the Father, and obey & do the teachings of Jesus, then they too will be told to depart from Jesus. These 3 areas of ministry, prophecy, exorcism and miracles are the most extreme examples of verbal professions, and yet if these people do not obey Jesus then they will cast from the presence of Jesus. Jesus is not just for their lips, but for their lives as well. Jesus is not just for us to say we follow Him, and not do as He asks, i.e. pay lip service. It is for us to say we follow Jesus and to do as he has commanded us to do. The difference is between saying we do it and actually doing it. People who pay lip service to God, may claim to do mighty works in ministry, but in everyday behaviour the works done are not good, but evil. We who claim to be the followers of Jesus, have made professions of Christ in our private conversations and publicly in our baptism. We appear to honour Jesus by referring to him as "the Lord", or "our Lord". We say the Lord's prayer in church, and sing songs expressing our love to Jesus. We may even teach in the name of Jesus, of mention & use his name in other areas of ministry in the church. Jesus, however is not impressed by our words, but wants us to do as He has commanded us to do. To be committed to Jesus, is to do the will of the Father. He asks for evidence of our sincerity in good works of obedience. Where the contrast in the last passage was between "saying" and "doing", the contrast is now between "hearing" and "doing". On one hand Jesus says that there is this person who hears these words of mine and does them (V24) , and on the other the person who hears these words of mine and does not do them (V26). To give us a clearer idea, of what the contrasts are he tells a parable (well known to us) about two builders. The man, who built & constructed his house on deeply dug rock is, according to Jesus, wise. Yet, the man who built his house on sand without laying a solid foundation is, according to Jesus, foolish. As both were building, anyone passing by probably would not have noticed any difference between them, because the difference was their foundations, and foundations cannot be seen. Only after a storm, floods and high winds, was 1he basic and fatal difference able to be seen. For the house that was built on rock, remained standing, whereas the house built upon sand was destroyed forever. In the same way, people who say they are Christians often look the same, whether they are genuine or fake. It is hard to tell. Both appear to be building solid Christian lives. For Jesus is not comparing professing Christians with non-Christians. What is common to both spiritual house-builders is that they hear these words of mine. So both are members of the Christian church. Both read the bible, go to church, listen to sermons and read Christian books. The reason why we cannot tell the difference between them, is that the foundations are buried deep and are invisible to us. Too question is not whether they hear the word of Jesus, but whether they do the word of Jesus. Only a storm can show the truth. A storm of crisis or trouble shows what kind of person we really are. How do we face up to the everyday trials of life? 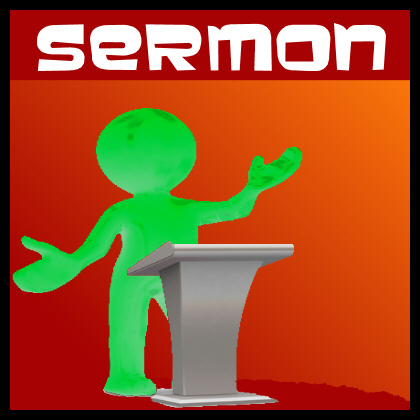 Do we hold up to the values expressed in the Sermon on the Mount, or do we just act like we used to do before we became Christians. 3. What is our response? The truth that Jesus would have us learn from these two passages, is that a mere intellectual knowledge or verbal acknowledgement can substitute for obedience to his word. The question is not whether we say nice, polite, enthusiastic things to or about Jesus; nor whether we hear his words, listening, studying, pondering and memorising until our minds are stuffed full of his teaching; but whether we do what we say and do what we know to be truth. In other words, is the lordship of Jesus a reality in our life. However, this is not teaching that salvation comes through good works or good deeds. No. No. Nor is it the way to enter the kingdom of heaven, by good works of obedience, because the whole New Testament offers salvation through the grace of God through faith in Jesus Christ and Him alone. Here Jesus stresses that those who truly hear the gospel and profess faith in him will obey him, and therefore expressing their faith by their works. It is in applying this teaching to our lives, that we can consider the reading of the Bible and belonging to the world-wide church. For if we do both of these things, then we have a serious responsibility to ensure that what we know, and what we say is translated into what we do, and how we live. Jesus places before us radical and life changing choices,. He commands us to be real followers of Himself, joining a new culture; the Christian culture; and abandoning the old culture of the world. He repeatedly called his followers to be different from the world. We are to be salt & light, in a bland and dark world. The world is like food that is rotting, full of bacteria causing it to decay rapidly. As the followers of Jesus, we are to be salt, stopping its decay. The world lives in darkness, a gloomy, dank & shadowy place. Christians are called to be light, throwing out the darkness & gloom. Then Jesus moves on to more specific areas. Our righteousness is to be so deep that it reaches our hearts, and our love is to be so wide as to cover everyone including our enemies. Our giving, prayers and fasting are not to be as the Pharisees were in boasting, but rather to be real, and in secret to as not to compromise our Christian integrity. For our treasure we are to choose what lasts through all eternity, not that which rots away here on earth. We are to have as our master, God, and not money or possessions. Our ambitions should not be our own material security, but the spread of God's rule & righteousness in the world. It is clear throughout the Sermon on the Mount that we are called to imitate our heavenly Father. He is a peacemaker, and loves even the ungrateful and selfish. We are commanded to do the same, copying him and not the men of the world. Then we show to the world, and to God, that we are truly his sons & daughters (Matthew 5:9,44-48). We are offered the choice, either to follow the crowd in the world or to follow our Father in heaven. We are given the choice of being ruled by the opinions of the world or being mastered by God's word. Jesus draws out for us, only two ways: we are either for him or against him. There is no standing with a foot in either side. We have two ways to go, a narrow or broad gate, and two foundations we can build, either on rock or on sand. The narrow gate built on rock, is the path to life, while the broad gate built on sand leads to death, decay and destruction. The answer to these choices is important and certainly much more important than our careers or marriage partner. Which road shall we travel on, and which foundation shall we build our house on? Those who decide for Jesus, choose the narrow gate, and a firm foundation in Jesus. Which ones will we choose? Many people from all different religions are quite ready to accept the Sermon on the Mount as containing wonderful truths. They know that it contains phrases such as 'Blessed are the merciful, for they shall obtain mercy,' 'Love your enemies,' 'Judge not, so that you may not be judged' and 'Whatever you wish that men would do to you, do so to them'. These sayings, they say, show Jesus as a great moral teacher. However, they are not prepared to acknowledge that He is God and has authority. Yet, what hit the first hearers of this sermon was Jesus' authority (v29), and it drove them to be astonished by him and his teaching. If we read it, we too should be astonished by the teaching. Just like in first century Israel, the Sermon on the Mount goes against everything we are taught through our family, schools & culture. If Jesus therefore has the authority, we should not only listen & read it, but also do it. Jesus laid down the law of God. He expects people to build the house of their lives on his words, and adds that only those who do so are wise and will be safe. He says that he has come to fulfil the law and the prophets. He is both the Lord to be obeyed, and the Saviour to give blessing and salvation. He places himself in the judgement seat. He speaks of God as his Father in a unique sense, and implies that what he does, God does and that what people do to him they are also doing to God. The claims of Jesus were spoken so naturally, modestly and indirectly that many people never even notice them. But they are there, and we cannot ignore them. Throughout the Sermon on the Mount, we have seen the Jesus is teacher, the Christ, the Lord, the Saviour, the Judge, the Son of God and also God.. Either all these things are true, or he was a power seeking maniac suffering with insanity. But the Sermon on the Mount could never be the product of someone who was either insane or a seeker of power, because it would go against what was taught in the Sermon on the Mount. Our only alternative then, is to take Jesus at his word, and his claims for all that they are worth. The Sermon on the Mount contains the picture for God's alternative society, with the standards, values and priorities of the kingdom of God, not the kingdom of man. Too often throughout history, the church has conformed to the pattern set by the world, and ignored the pattern required by God and by Jesus. Sometimes, there is no difference, with the Church having lost its saltiness, and its light put out. It is only as we the church, live the truths in the Sermon of the Mount that a true Christian community will be attractive to those outside in the world, and let God be glorified. Jesus therefore, when he calls us, calls us to be the unique Christian culture in a world full of lost culture. So here is a challenge for you. Are you, as a Christian heeding Jesus' words and being obedient to them and therefore living a life worthy of being called Christian? Are you being salt and light amidst those who are in darkness and in a lost culture? Finally, if you would not call yourself a Christian today, and this Jesus appeals to you, this Jesus who speaks with authority, and you want to become a Christian there are three simple steps to follow. Firstly, admit that you have done wrong against God and His ways. Secondly, believe and trust in Jesus. Call on Him, receive, trust, obey and worship Him, recognizing Him for who He is and what He has done. Lastly, confess Jesus as your Lord and Saviour. Once sin has been confessed, and Jesus is believed in and trusted as Saviour, then you are a Christian. Now you are ready as Peter writes in the Bible, "to grow in grace and knowledge of our Lord Jesus Christ" (2 Peter 3:18). Welcome to the family of God. God has chosen you; Jesus has paid for you and has put His mark within you through His Spirit (Ephesians 1:1-13). Closing prayers including those who are being baptised this weekend - particularly Florence. 5 questions! 1 minute! Are you ready? 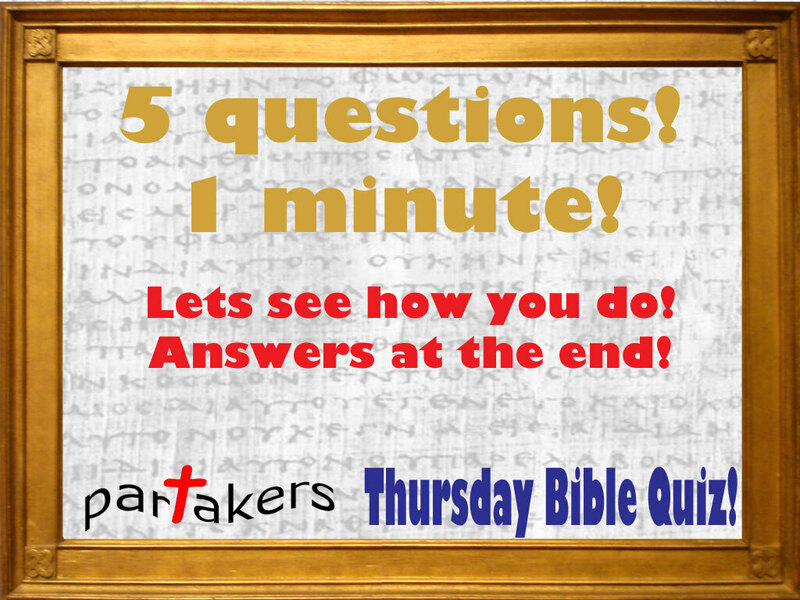 Bible Talk – God as Father! I wonder what your relationship with your earthly father was or is like! After all, the vast majority of all people, to some extent, have had an earthly father or father-figure. Your father may never have shown you love, consideration or friendship. On the other hand, your relationship with your father may have been everything you could hope and desire for in a father-child relationship. 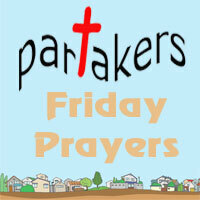 Either way, cast aside all thoughts of your earthly father, as we consider together God the Father. Perhaps you are one of the minority who had no father or father-figure in your life at all while you were growing up and developing! Well there is good news for you as well!. We are going to look today, very briefly at God the Father! The defining function of God the Father is that He is the Almighty who intervenes, sustains and provides for all things. God the Father is a perfect father. He is the Father of all creation! As all of humanity is made in the image of God, the Fatherhood of God must apply to all humanity. God is the Father of our Spirits (Hebrews 12:9). God as Father wants everyone to be in His kingdom (Luke18:16). By wanting to be called Father, this means that God is a personal God! He loves all of His creation and He sustains it! He wants them to be in a relationship with Him! He is the Father of Jesus Christ, the Son of God! From when Jesus as a twelve year old proclaimed he was about His Father's business, to His teaching on prayer when He said to call God, Father; to the agonising prayer of John 17 and in His final words on the cross, Jesus cried out "Father God, into your hands I commit my spirit" (Luke 23v46). The words Jesus spoke were those He heard from the Father. The actions Jesus did were those He saw the Father doing (John 5v19). And because those who follow Jesus Christ, God is Father because Jesus Christ was the Son of God (Romans 8v17; Hebrews 2v17). The followers of Jesus Christ, those who are Christian disciples have been adopted as heirs and as children (John 1v12). As a follower of Jesus Christ, we are to partake of the Father's nature (2 Peter 1v3-4)! God the Father both cares for His children (Matthew 6v32) and disciplines His children (Hebrews 12v6-8). Above all, as followers of Jesus Christ, we can never be separated from the love of God the Father (Romans 8v39). Isn't that just the most amazing fact! Know and remember, that as a follower of Jesus, God the Father adores you!! As we study Psalm 66, we shall find that it is a prayer of joy. The reason for this is, because where ever hope can be found, there is always joy. This is particularly true of the Christian life. As christians, our great hope is knowing that through the Lord Jesus Christ we will have salvation. Salvation is freedom. Freedom from injustice, freedom from sin. It is freedom from our prison of looking after our self, to a new life of entrance into self-forgetful worship & service to God. It is freedom from the limits of pain, decay, death, and entrance into a new world of life, immortality, beauty and joy without end. That is the hope of the Christian, and that is why we can have joy as Christians. But joy, is not just for the future. Joy is also for the present, for the here and now. But, what is joy, and what place should joy take in our life today. But first we will look at Psalm 66, and see where joy fitted into the life of the Psalmist.